"Wednesday was market day in Apt. Everyone waited all week for the big day with great anticipation. Most of the business for the week was done on market day. Farmers from near and far would fill the town to capacity. The town was overrun with horses and wagons. Some farmers came very early to get choice spots. There were three market areas. The main market, on the town square, was for produce, diary products, poultry, raw materials, and manufactured goods. A second, smaller market was located in front of our house, for the spillover from the main market. 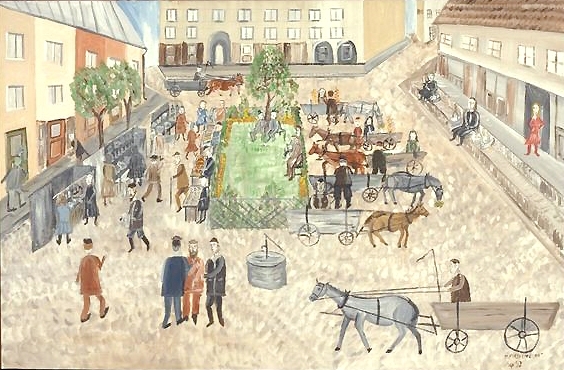 A third market, for livestock, was on the torgaviske, a big open space on the edge of town, next to the Jewish cemetery. That was where farmers sold their livestock, took their female animals to Szulc to be serviced, or traded a horse up for a better animal." Mayer reminisces about Market Day in Apt (Opatów). Listen to it.